It’s a simple sheet, with two tables. One for gifts, and one for tasks. The tasks one is pretty straightforward. It lists things that need doing by Christmas, what I need to do them, and when I need to do it. The tasks run down the side under “To Do” and then the columns read: Purchase what?, Zone, Begin, and By when? All of those should be pretty clear. “Purchase what” lists all the things I don’t have on hand that I need to complete the task, “Zone” lists where that thing comes from, and who gets it. (Me vs Joe) “Begin” is when the task needs to be started, and “By When” well, you can figure that one out. Everything I need to do is on this list. Bake cookies, make ice lanterns, menu for Christmas Brunch… everything. As an example, the first task is “Put up Tree”, and following that task along, it says “2 strings white LEDs” “Canadian Tire” “December 5th”. The part about buying lights was keyed to a reminder in my calendar, so that it got done while the store still had a selection of lights, so that I didn’t leave it so late that all was left were the multicoloured flashing ones. (Not that there’s anything wrong with that, but it’s pretty much the opposite of what I want.) The reminder popped up in mid-November, and the next time Joe said he was going to Canadian tire, boom. Done. Idea – this is what I’m planning on doing for them. What I’m going to buy, what they’ve dropped hints about, etc. I colour it green when it’s a solid decision. Stocking: This is where I list everything I have to buy for their stocking. I colour things green as I buy them. (Or add them as I find them, and colour them green.) At a glance, I can see what I’ve got for each person. It really, really helps me from going overboard. I can see it all in one spot. (As an aside, I also put the stocking stuff into individual bags, one labeled for each person, as I go along. Then it’s all sorted when it’s time to help Santa.) I don’t delete things as I get them for this, just colour the text green. I want to see what’s there. Shopping: This is an important column. It lists everything I need to buy – including yarn and groceries. I delete things as I get them. I can scan the column and see what it is that I need. Deadline: This column is easy. It’s when it needs doing by. We celebrate with different people on different days, and it’s easiest for me when I list all that. As we make our holiday plans to gather with people, I plug in the day I’ll be seeing them so that I can prioritize, and avoid that wrapping at midnight thing. Wrapped: I do this one for two reasons. First, I can’t colour in the square until it’s wrapped, which sort of motivates me to get it done, and because a few years ago I searched the house for a book I’d bought my sister for 45 minutes, sobbing because I’d lost it, and the whole time it was wrapped under the tree. I don’t want to live that way. Now, I know where things are, and what that package is. For every cell, I colour it green as it’s completed – and I also colour a cell red if it’s a problem. (For example, I ordered something, and it’s not going to arrive on time, and I need to do something about that.) When the whole thing is green, bob’s yer uncle. Christmas is ready. I get up every morning, and while I drink my coffee, I consult the spreadsheet (and calendar) and ask if there’s anything I can do on it that day to make things better. There’s always something that can move me towards a green square. Now, I know this approach isn’t for everyone. (Joe, for example, hates the spreadsheet. He’s a fly by the seat of your pants guy, and enjoys that.) It’s meant a world of difference to me though. Makes me feel like I’ve got it all in one place, and I can see what’s happening. For me, it’s reduced work, and shopping and rushing around, and made the whole holiday season totally do-able without tears, which is the whole goal, right? You’re supposed to enjoy this time of year, and around here, if Mama ain’t’ happy, ain’t nobody happy. It’s also had a really amazing side effect. It’s improved my ability to accept help. It used to be that I was so overwhelmed and all of the jobs were so disconnected, that if someone tried to help me, I honestly couldn’t think of what they could do to get me out of trouble. I’d refuse the help, because sorting that out seemed so complicated. Now? Now if someone asks what they can do – I take a look at the spreadsheet and I can see what exactly needs doing. I can see if they have time to pick up one of the things on the list, or if what I really need is time to do something that only I can do, I can give them the task I had for that day. Sam can’t knit socks for my brother, but she can totally wrap a few finished things while I knit. Joe can’t bake cookies to save his life, but dude can stop at the drug store on the way home for stocking stuffers and more tape. It’s made things a lot better for us, and somehow made it so that we work together better. I really like it. That’s it. The whole approach. Take it, and do what you will with it. I can guess that it’s not Lou’s favourite, since he’s waited this long to hang it, but what else could I expect? 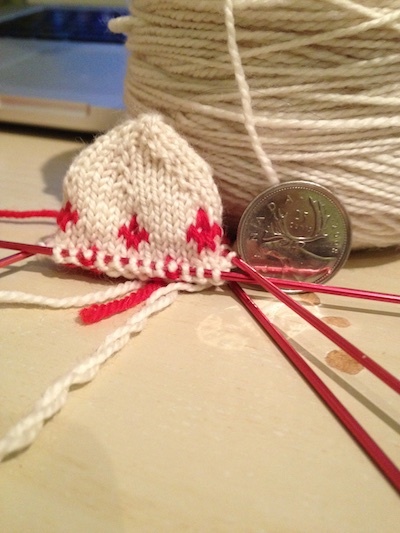 (If I was 2 3/4, my auntie making me a toque would be low on the list.) This morning, Carlos texted and said Lou picked “el gorro” which I guess is Spanish for “toque” because I swear to you I though that “hat” was sombrero. Live and learn. I knit this hat from the pattern, pretty much exactly (except on 2mm needles to make it small enough) and really the hardest part was making the tiny pom-pom. Gift for knitters, Day 15. You know what’s hard? Counting. I know that’s disappointing to hear, what with the way you non-knitters think that it’s easy, but knitters have to do it all the time, and we’re not great at it. (It doesn’t help that you keep talking to us while we do it. Here’s a good way to give a gift to a knitter, if you see them with their fingers on their stitches, and you say something to them, and they reply with “32, 33, 34…” they’re counting. Shut up for a minute. Here’s another tip, you know what’s not funny? Saying other numbers while they’re counting. That’s little brother crap from when we were all kids. Don’t do it.) Your knitter (even if you stop messing with them) probably needs some help counting stuff. Buying them something to help with that could make up for some of the times you were the reason they unsuccessfully counted to three four times in a row. There’s a lot of ways to help them – I love these Ablets. It’s a knitting abacus, and it’s very charming, and a great way to rock counting old school. (Heck if it was good enough for Demosthenes, it’s good enough for a knitter.) These bracelet versions are a good option too… and like the Ablet, look like jewelry. There’s more modern ones too, like this kind you click (it’s got a cord that goes round your neck) or this digital one that goes on a finger or thumb. For complex counting missions (counting more than one thing happening different numbers of times, like rows, increases and repeats, all at once – your knitter is a genius by the way, they do that all the time) this Sirka Counter is just about the coolest ever. I have this app that I use sometimes, but it really drains your battery, and the batteries on the Sirka never run out. The root of “sombrero” is “sombra,” which is “shade,” so a sombrero would be a hat with a brim. Something to keep the sun out of your eyes. I like the Smartie idea and I love that your knitting needles co-ordinate with the tiny hat being knitted on them. That spreadsheet is a work of genius. Thanks for sharing it with us. This spreadsheet description validates my entire life approach! I have spreadsheets for sooooo many things, and my husband thinks I’m crazy. I might be crazy, but at least I’m not alone in my spreadsheet joy. I use a similar, although less complicated, spreadsheet for Christmas, but then I use spreadsheets for nearly every kind of record keeping. I too have started the SS for 2015 — it’s simple. The tasks are the same and the people who receive gifts are pretty much the same, so I just delete the completion of the task or the completed gift. Friends make fun of me and my spreadsheets. I like organization. My little translator widget says a gorro is a cap. Whatev. Our Christmas is going to be a bit weird this year with comings and goings, and if I had planned a spreadsheet of joy, I would have ripped it up by now because already things are not going as planned. Luckily we are a small bunch of the seat of the pants routine will likely be just fine. Santa always figures these things out. Well, that makes no sense… We are a small bunch *and* the seat of the pants routine will be just fine! Meh. My brain skipped right over the *of* and replaced it with *and*. No harm. No foul. Even with a spreadsheet, I don’t know how mothers make it through Christmas. (Fathers either, , but mostly mothers, let’s face it.) Also: Do you always coordinate the color of your needles with the yarn? If I can. it’s a small pleasure. Love the spreadsheet idea – I use something similar all year long for birthdays and as a “to do” list. You and I would get along fine! That sounds a lot like my approach, although mine’s a OneNote notebook instead of a spreadsheet, I also keep track of past years gifts (so I don’t give the same person a blue scarf three years in a row, unless they REALLY like blue scarves), and I use it for birthdays too. We seem to have tree light attrition. No matter what I do there’s a dead string every year. Last year I went to the dollar store, and the ones I got were total junk, and not energy efficient. I’ve replaced them this year with good ones. I bought an extra. Maybe next year I’ll be okay? I had been wondering the very same thing about the lights. Hopefully this year’s will last! Also, gorro is a knitted hat. Gorra is a baseball cap. And, as commented above, sombrero is a wide-brimmed hat. Don’t worry though, what Spanish has in variety of hat words it makes up for in lack of variety of certain other words, my favorite of which is “straight razor”: maquinilla. Oh, you mean the “little machine” my husband uses to shave his face. Hahaha. If nothing else, it could become a little tradition that ‘Santa’ gives a gift of tree lights to The Household every year, lol! Perhaps for Solstice, and the Return of the Light? Do they work? Do you have tender plants? Non-LED old-school white Christmas lights, the non-efficient kind you can’t buy anymore, are wonderful for people growing plants outside their cold zones. You may not have included all the details, but filters are very useful in Excel, & this sounds like an excellent example. Filters are the best part of Excel! Why in hell is that adorable gorrito top down? That feels like the only thing in the world that could make it more finicking. I know! I made this ornament last night and said “F*** that” to the top down and just went in reverse. I flipping adore wrapping presents. Like I’ll even do the fancy folds and the pretty ribbons and the wee ornaments tied on top. I just don’t do the rest of Christmas. Seriously, we canceled it one year and have just kept it canceled ever since. And wrapping presents is the only part I miss. Find your local me, and she will totally wrap your presents and love it. Ditto—my mom very wisely noticed and encouraged my early love of Christmas wrapping, and I don’t think she had to wrap a present for the next 14 years, ha! I’m there with you on the slight panic (I was looking at your Twitter sidebar) – I have one project left for Christmas…But the smallest needle size on it is a US 19, and the larger is a US 36, and it’s two strands held double and it’s going to kill my hands, I think. I love your spreadsheet. I think I should be making one for my “business plan” for 2015! I am going to start a spreadsheet Right Now–even for the rapidly-appproaching 2014 Christmas. I’ve been wondering how yours worked since you started it. Thank you! 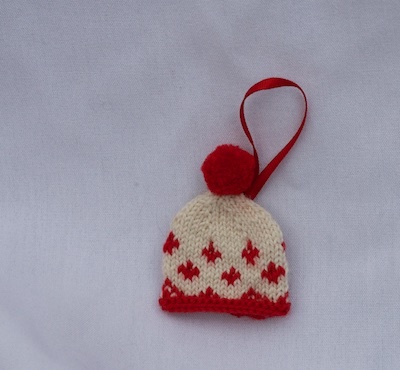 another gift for knitters and those of us who do Christmas, knitting or not. I am with you on the spreadsheet. I have a spreadsheet that lists every single person I need a gift for, their budget, a column for what I buy them, how much I’ve spent, and whether or not I’m done. I keep them all, so I can remember if I gave that book I know Aunt Sally will love to Aunt Sally last year. It also means that if I’m shopping in July while on vacation, and see the perfect thing for Uncle Joe, I can buy it right then and there, add it to the spreadsheet, and remember in December that I’ve bought it. I’m quite frankly stunned at your level of commitment for the holiday. Perhaps if I had a large family I’d feel more motivated, but it seems that every year I do less and less for Xmas. No more cards, no more cookies–it seems I’ve got down to the bare bones of presents and a nice dinner. Not much planning required. No possibility of let-down. Probably not as much fun as your version. I’ve similarly pared Christmas down. Who eats all those cookies all the magazines feature on their covers? Who can afford to eat all those cookies? With our kids, we now draw names for a gift-exchange, The grandkids still get gifts galore. Every time I read about Christmas stress, I want to shout: Just Stop driving yourself crazy! But then I must also confess that Stephanie’s Christmas sounds wonderful too. And, one year of no gifts taught us that we really enjoy giving gifts and missed shopping for each other. But, Christmas Eve had become a huge stress and so now we do our big extended family party the weekend before and Christmas Eve is church and immediate family time. Cards never felt important to me, so I haven’t sent them in years. Etc etc. I’m 7 months pregnant and can honestly say that, ten days out, I’m still truly enjoying this Christmas and don’t feel like I’m pushed. I have a list similar to Stephanie’s spreadsheet and any time I look at it and think ‘this isn’t going to work’ something gets ditched – or delegated to someone else who still wants to do it. Oh – and I always, always have a back up plan for any handmade gift that isn’t done when December starts. I love your idea of taking cookies to staff at a nursing home! Thanks for sharing. I swear this spreadsheet is more complicated than the quantum mechanics class I am teaching. I have always wondered about the holiday spreadsheet and how exactly it works. I swear I might need to do this next year. Every year a week before Christmas I am a total stressed filled wreck! This year especially. Your spreadsheet sounds like so many of my project plans I use at work. We are wrapping up our Benevolence Drive at my job. One of the things on the project plan: Benevolence Faerie. That would be me. When you have to wrangle about 100 lawyers, project plans are essential! wow, you have taken organization to a whole new level….I am in awe and bow to your spreadsheetness. i have to laugh about your light shopping, and the fear you would only be able to find multi-colored flashing ones. my daughter and i had to go to multiple stores to find those, as those are what say festive to us. plenty of plain white ones and multi-colored ones, but no flashing lights in festive patterns. i was afraid they weren’t making them any more for some reason. when i finally found them, at home depot of all places, i bought two strands just for insurance. I have a to-do list, but not quite as elaborate as yours! 1. I only wrap family gifts in fabric bags that have the ribbons sewn into the bag….this allows me to plop the gifts into the bags…and on Christmas morning there is no trash. We fold up the fabric gift bags for the next year. Easy and environmentally friendly! A great way to use up a stash of fabric, too! 2. To keep myself from going overboard buying stocking stuffers throughout the year, I keep all the stockings in a storage chest. As I buy a stocking gift I put it into the stocking, allowing me to see when to stop! This has prevented me from having too many items. I love the toque too! And, that spreadsheet thing? Wow! genius! I’d love to implement your system, but I’m not sure I’d faithfully keep on top of it. What timing! I was starting to panic today and started my own spreadsheet this morning. You see, it’s all been too easy. I only knit two gifts this year, I bought work gifts months ago, kid gifts are done, decorating is done, dinner will be an array of appetizers. It has all gone too smoothly, I tell you. So I made a spreadsheet this morning to make sure, and guess what? I still have some gift shopping to do! All hail the spreadsheet! I’m sure it has saved me. I have one of those digital counters, which I love passionately. Before it came to me, lace knitting just never worked. Never. Now I can really do it! Go for the digital one. Another vote for the spreadsheet. Started it the first year I was a mum, when nappy brain pretty much slayed me. I love it! Mauve for gifts not yet decided/bought, orange for gifts on order, yellow for ones I have to do something to, green and pink for random ‘look at this’ and slowly the sheet turns calm as snow with animal tracks all over it….and exhale. Brilliant! And very important to me: To do’s move to Ta-Dah! – that so helps. I’m so excited to ‘know’ someone else with a colour coded spreadsheet! Mine is only gift and pre December jobs, but I think I might extend it. This year is experimental for us, as my daughter just started school so timings are all different. Same colours, though – red for Not Done, yellow for ordered/bought, green for wrapped and posted or with a scheduled drop off. I love the idea of shopping deadlines on it, and I am totally doing that next year. This year I am taking a break for making for others, and making for us – all the handmade decorations that never quite get made in the rush are my project this year. I love the fabric bags idea, too. Stockings run to a formula in this house, so it would be great for them. Gifts for family are usually consumable, so tend to go in reusable packaging anyway. My mum even cross stitches cards that go back and forth and round and round. Some of your advent decorations for Luis would make great cards, I think. Love the explanation! This is helpful for those of us who aren’t good with spreadsheets. And now back to my holiday preps. I understand why you keep your Christmas “complicated”. You keep the things that you enjoy and that matter to you. Gajillions of Christmas cookies mean Christmas to me, since my mother loved to bake. Tree with pretty lights and ornaments brings me great joy. Christmas cards keep me in touch with far-flung friends and family in a way that feels more personal than Facebook or email (though that’s the one that falls by the wayside on occasion). Simplifying things makes it better for some people, others feel sadness and miss the traditions. The spreadsheet makes it work for you. I haven’t done a spreadsheet but I do lists with varying degrees of effectiveness. Might have to organize into a spreadsheet. I use the clicker counters that go around the neck and have several. I use the yarn from what I’m working on as the yarn to put it around my neck. If im interrupted, then I know which counter is for what garment. Wow, hanging the counter by the project’s yarn is such a clever and helpful idea! I’m downloading that app right now. I’m the Keeper of Spreadsheets here, although our Christmas one is pretty small so far–no kids yet and our extended families aren’t that big. I do use one to track gift-giving, though, AND gift receiving. That way we remember when it’s time to write thank-you notes (though my flaw here is forgetting to actually put them in the mail). I have a spreadsheet, but I use two colours. Yellow means I have bought it/ordered it. Green means it’s wrapped and ready to go. Perhaps your next book could be the Yarn Harlot Organization Method? I’m terrible at procrastinating and panicking, but this would definitely sort me out! I mean it – sounds like a knitter-friendly approach to project management. Also, I worry about the extra work a daily blog post (including weekends!) is causing. Is that also on the spreadsheet? Just for trivia, the British 5ps shrunk a while back, so now they’re the same size as dimes. I’m totally with you on the spreadsheet (and the white only lights!) This reminds me of a conversation I had recently about how when my kids were wee I organised their toys in small bins – one for cars, one for Lego etc. The bins resided on a low shelf. Other mothers thought was crackers for doing this and many employed the One Large Toy box that everything could be dumped in at the end of the day. However, I saw this toy box in action and found that kids could not navigate this box at all and just dumped it all out and often then walked away – it was overwhelming. So really The Spreadsheet of Christmas (or life) is just avoiding The Big Overwhelming Dump of Doom. That was way too wordy to say I’m with you all the way! I also did the smaller bins for toys, but used tackle boxes for the Legos. The smallest pieces went in the small compartments so they didn’t get “lost” at the bottom of the box. It means that they linked to this content in their own blog. Usually it’s a link, with their own content, but in the case of Yarn Buyer, they copy my whole post to their own blog. Just a quick agreement with the Sirka counter. I absolutely love mine and see that they made the only improvement I could think of – one where you can hang it from your neck and see it “right side up.” It’s so handy to keep track of multiple repeats, decreases, etc. My hubby *loves* spreadsheets – for everything! I often feel they are more work to set up and maintain than they are worth. This year, however, my brain seems to be incapable of keeping everything straight, so I started a spreadsheet (horrors!) to show what I bought, whether it has arrived in my home (either through delivery or whether I bought it at the store), who it is for, whether it is wrapped, whether there are multiple givers (who need “credit” on the gift tag), and the items designated as “Santa” gifts (one gift for Christmas morning) and the items going into the stockings. Each person has all their gifts together, so I can quickly see if I’m a little light (or heavy) for any one person. At this point, I start to lose track of stuff as it arrives, and I’m not sure if I have it or not, or where I put it. At least I will know now when it’s all in my house. Once wrapped, I know where to look for it! Thanks for all the suggested gifts for knitters – while I’ve been knitting a long time and have a lot of the tools, and there are other things that just aren’t my style, my credit card flew out of my pocket on Saturday when you listed hand creams, etc. I’m hoping this is as good as it sounds! You and Luis gave us all something to toque about! I started reading aloud to my husband “if you see them with their fingers on their stitches, and you say something to them, and they reply with “32, 33, 34…” and he immediately began to laugh. I guess he is familiar with this situation. Holy cow, I love this spreadsheet post. I have something of an unhealthy obsession with spreadsheets, and I really thought about asking if you’d be willing to share yours, but I know some people consider it sacrilege to share a carefully built personal spreadsheet. I have my own version of a Christmas spreadsheet, and I’m just this year expanding it to include baking. Thanks for sharing yours, this made my day! I think the toque is too cute for words. But Luis might have been more connected to a miniature version of the Angry Owl hat, although the construction might have driven you more crazy than this one. I wish my spreadsheet was as good as yours. I have my to-do tab: ideas needed, shopping needed, crafting needed, etc. and my daily tab (for things to do on specific days), but I love yours so much more. Plus, a friend was telling me today that she didn’t know if something was going to make it from an online store and the discussion led me to mentioning that I have a spreadsheet for all my orders, due date, and shipping agent. I’m pretty sure that she laughed at me! Here’s to joy in being organized! I am so greatful that my family hasn’t done any holidays in nearly 30 years. None of us regret giving it up at all! I have kept a spreadsheet for years, mostly for budget and crafting deadlines. Yours has some features I will add to mine. I love “outsourcing” things so I don’t have to keep them in my head! Reminder: spreadsheets, KEEP A BACKUP. My entire list is on the laptop that died this fall. Sin e I buy and plan year round, this is devastating!!!!!! It would be interesting to see how many of the “spreadsheet people” are Virgos or firstborns, both of whom tend to be super-organized, especially if the firstborn is female and has (younger, obviously) brothers. I am both a Virgo and firstborn sister with brothers, a double whammy of organization. Or Enneagram Ones. They have high standards and work hard to maintain them (and expect the same high standards from others, which can cause problems). Ask me how I know. I’m also a Virgo, but not a firstborn. How do you know whether your spreadsheets really work? After all, how do you know whether or not we go in and mess with them while you’re sleeping? Be good to us or you’ll be on OUR naughty list! I detect a certain “Presbyteria” tone to this comment by “Anonymous”. Can I put in another suggestion for a counting app? County (http://ravulo.us/about.html) is great and doesn’t drain my batteries! Thank you for sharing about your spreadsheet, Steph, it’s brilliant! We celebrate Hanukkah and all of my planning went down the toilet when hubs got a last minute call for hip replacement surgery. I ended up writing cheques and throwing them in the mail. The hand knit items will be given out when they visit later. It’s going to be a different holiday this year. The toque is the cutest thing evah! And the spreadsheet looks life changing. Thanks for sharing! Have been trying to think up a way to make tiny pom-poms for a while now. I obsessively look at cutlery everywhere, looking for tiny tiny forks with either 2 or 4 prongs (ha! they don’t exist). Fondue forks! Look for them at yard sales or in junky antique stores. And I second the request for a demonstration of how you make pompons on the end of a pencil. I was thinking about buying a yard of pompom trim at a fabric store and cutting them apart. You are a goddess. Now, if only I had read this in, say, July. Before I moved. My kids are going to their dad’s tomorrow, I won’t see them until after Christmas, and I haven’t cleaned up the craft mess from Halloween, because it was an explosion of “I finally have a real house and I’m not in grad school and I can do all.the.things like decorate and craft and …..” Oops. Maybe I should have saved that burst of energy for Christmas. As it is, they have the flu, anyway. I’ll have to organize for next year. I only just made my spreadsheet for THIS year yesterday. I probably WILL be wrapping and crafting on Christmas Eve! …and WOW your human verification test is the best one I’ve ever seen. THANK you from a woman whose eyes don’t work so well before coffee. My husband has always wanted tons of lights on the tree, we’re never actually home at Christmas or for several days surrounding, and he wants the tree up until 12th night. So a couple of years ago he bought an artificial tree with 1000 lights on it. Surprise! – you CAN have too many lights on a tree. With the lights on, you don’t even notice the ornaments. Also, they’re tiny lights but not LEDs, so maybe we’ll buy a new one in a year or so. But he still has this urge to buy lights, only now it’s the battery operated ones with a timer in them, so he can festoon even stranger spots in the house. I am completely blown away by your spreadsheet. This is a level of organization that, er, um, is far beyond , er, um, your usual level of, er, um, you get it. And the toque is absolutely precious. I am so glad I’m not the only one who has a spread sheet. I list by person, then under their name, I have a column for what I want to get them (with a hyperlink if applicable), how much (roughly) it’ll cost, if it’s been purchased or made, (if not) the date it needs to be purchased (I try to break everything up over several pay periods), and if it’s been wrapped. When purchased and in my hands, the row turns green, and I try to wrap as I get things. Credit to The Bloggess as I was following a link in her post with Christmas gift suggestions and found it. Oh, that’s a fabulous gift!! I’m going to share that idea with my knitting groups — thanks!! Thank you so much for posting the Spreadsheet instruct!!!!! I love me a good spreadsheet and this one is going up just as soon as I get out of the soup I’m in today (not tomorrow I think). I shop and knit for Christmas all year, so this will keep me straight from day one. Now get back to work! Thanks SO much for sharing your spreadsheet! I can see ways to adapt this to other high-stress parts of my life already. I love spreadsheets and I’ve been fascinated by yours for ages. And this may be my flu speaking, but I just can’t visualize this spreadsheet (in fact, this must be the flu speaking… the only other time I haven’t been able to visualize what you’re writing about is when you are describing some complicated knitting that is above my garter-stitch loving ways). I must remember to try rereading this when the flu is over. I used to have a spreadsheet … and now I have an eight-month old! I love watching your Christmas unfold from afar. Living in the sub- tropics on the East coast of South Africa, our Christmas is filled with sunshine, humidity, and fairly regular torrential rain. It is so lovely to get a sense of how different the experience is for us, but also how similar it all is: we also bake, decorate, shop and wrap, but I’m afraid that I find it much too hot to knit at this time of the year. Hand knit gifts are reserved for birthdays in the cooler months! Since Christmas coincides with our summer holidays, the whole country shuts down around now, and with crowds descending on our seaside city, we are heading to the mountains for our Christmas – I think I may have to set up a spreadsheet of my own, to manage all that I have to do before we leave on Saturday! I particularly love your ice lanterns, but they would probably only last 5 minutes in this climate! I have to say this post really made me laugh! I loved the suggestions for counters! Thanks for the smile today! I am constantly amazed of your postings with such detail and pictures of each ornament. This little hat is just way way too cute to say how cute! No wonder you were nuts when you were knitting all the little ornaments. I love the spreadsheet idea but I am with Joe, seat of the pants flying is just such a rush! LOL! The spreadsheet sounds like just the ticket for my slightly-ocd, very-list-oriented brain. I think I may try it next year! I admire your tenacity and computer savvy. The spreadsheet alone would send me over the edge. The fact that you also make a large pile of Christmas gifts makes me feel like I need to lie down. Kudos to you, and I hope your Christmas is bright, because you certainly deserve it!!! I love spreadsheets, though I don’t use them for Christmas (much simpler preparations for me). I had to giggle at the idea of M&Ms as row counters- the chances of me absentmindedly eating a few and winding up with a really oddly shaped sweater….pretty high! I’ve had a spreadsheet since 1996. At first it started out being just for Christmas, and then I added birthdays on there, and then gifts received, with a columm for thank-you notes. Sure helps me keep things straight, and I’ve had to add my mother’s stuff on there as well, to keep her organized. This way we don’t go crazy trying to remember, since we both have horrible memories. I am also of the Spreadsheet fan club! I live by mine in this season. I don’t know if i could enjoy Christmas without it . . . i would worry i was forgetting something important! Lady you should be running the world with that type of dedication and organization and teamwork. I am seriously impressed with that hat, what a teeny tiny little thing, but it’s perfect. I would have needed a magnifying glass. My life would have been so much better had you been my mother/example. (Or if mine had been organized (at all) instead of “just” creative). Inspirational. Thanks. Thanks for pointing out the Sirka counter. I now have to have one! Just need to decide between the original and LP version. Oooooo your spreadsheet looks like a wonderful idea! But that M&M idea as a counter looks fantastic and not complicated! Brilliant. Just brilliant. Thank you so much for sharing the spreadsheet. I’m totally going to use this idea. Because it does get more complicated once you have in laws and grand babies and the hours shrink. Thank you thank you! thank you ever so much for the info on your spreadsheet. While I have never used a spreadsheet, I do have the desire to learn and to be organized. Peace and Joy to you and your family. I truly am enjoying your blog of the advent calendar and will make this my first spreadsheet project…. I think you may have saved Christmas for me. I was always so hassled by the holiday because I had to make the magic happen that I gradually reduced what I do. One year I was so late getting a tree that they were all gone! But I miss the magic. So, I have already started a Christmas 2015 spreadsheet a la the Harlot and can see Christmas magic in my future. Thanks! I’ve been enjoying Stephanie’s holiday vicariously whule drastically altering mine. No tree this year — I live alone but since my son got custody of the Grandboys, ages 2.5 and 8 months, I’m at his house, granny-nannying, more than I’m home. Gifts for Grandboy 1 and Great-nephew 1 will be wrapped. It’s fun to watch them rip open the paper. But most other items will be bagged (and the bags will be reused, either for gifts or carrying lunches or as traveling yarn “bowls”). No fancy baking, although Grandgirl, almost 13, probably will make pumpkin bread from a mix. No church service: we’re “nones” to vaying degrees. The extended-family party will happen on the 26th, and will be a real joy. There’s a remote chance that I’ll get the Grandboys’ skullies knitted in time, but finishing hats and a sweater for Wool-Aid to ship to Syrian refugees is getting priority. When the yarn dedicated to that project is used up, it’ll be the Grandboys’ turn. 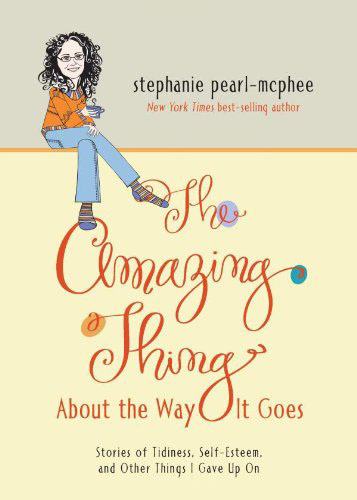 I doubt even a spreadsheet could save me, but thanks to Stephanie’s explanation, I can fantasize that someday I, too, will be organized. Happy holidays (ALL of them) to Stephanie, her family, friends and faithful readers! Considering how much you do, the spreadsheet (or any other organization system that works for you) is very, very good.. I’ve had those sobbing moments too, and I don’t ever want to have them again.. But thank you for the M&M suggestion! That’s perfect for me :-). Although I might have to supplement with some directly out of the bag.. I just made this ornament last night, completely inspired by you! When it came time for the tiniest pom pom I didn’t have a pencil within reach, but I did have four size 1 DPNs, so I held those together and wrapped the yarn around. This worked SO WELL because when it came time to tie I could slip the yarn in between the DPNs and then when I needed to cut I could slide a DPN out one at a time to have a bit more wiggle room. I also modified it to knit from the brim up, and was pretty happy with that decision. I tagged you in my result on instagram (@smithknits). Thank you so much for all the inspiration this Christmas season! I’ve only recently found your blog and it’s been so wonderful to follow. He gets to think he flew by the seat of his pants while you were the pilot all along. And likewise, every fly-by-the-seat-of-their-pants kind of guy needs an organized person to direct their energy so they don’t waste (too much of) it. Myself? I’m a little of both. And I have a minion who is less organized than I, and willing to “help out” (be directed). Occasionally. What’s up, the whole thing is going nicely here and ofcourse every one is sharing facts, that’s really fine, keep up writing. Exactly what does it indicate not economically but socially when home values far surpass median family earnings?